Cornelison also will perform at the 100 Days Out Party on Friday, Feb. 15 in Indianapolis and will attend other events on the INDYCAR and Indy 500 promotional calendar. Cornelison is known to sports fans everywhere as the powerful voice behind “The Star-Spangled Banner” at Chicago Blackhawks’ home games. He also has captivated Indianapolis 500 fans and viewers for the last two years, generating widespread praise and social media applause since taking the “Back Home Again in Indiana” mantle in May 2017. He became the first performer to sing “Back Home Again in Indiana” in consecutive years since the retirement of Jim Nabors in 2014. Nabors sang the tune 36 times during Indy 500 pre-race ceremonies between 1972-2014. Cornelison is a 1992 graduate of the Master of Music program at the Jacobs School of Music at Indiana University and has been the popular singer of the national anthem before all Blackhawks’ home games at the United Center in Chicago since the 2008-09 season. His soaring vocals and spirited style have welcomed millions of network viewers to the Stanley Cup Finals over multiple championship runs for the team. Cornelison’ s widespread appreciation and popularity in Chicago is also evident on his resume. He has performed before games for every major Chicago professional sports team, including the Chicago Bears’ home opener since 2010. Cornelison, a tenor, sang with numerous opera companies before becoming one of six accepted apprentices from more than 800 applicants for the Lyric Opera’s Apprenticeship Program in Chicago in 1995. He has performed nationally and internationally with some of the biggest names in opera, including Placido Domingo and Zubin Mehta, and with opera companies in the United States, United Kingdom, Belgium, France and many other locations. Washington state native Cornelison has a strong commitment to the U.S. Armed Forces and to charitable organizations. He serves on the advisory board of the Illinois Patriot Education Fund, is the honorary squadron commander of the USAF Band of Mid-America and an honorary member of YPO-Gold. He regularly participates with charitable organizations such as Dreams for Kids, the USO and veterans’ support groups. 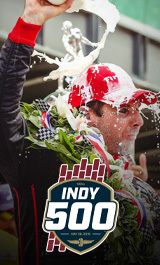 2019 tickets: Tickets for the 103rd Indianapolis 500 go on sale at 10 a.m. (ET) Monday, Oct. 29 at IMS.com and the IMS Ticket Office. Visit IMS.com for ticket options and more information. Kids 15 and under are free to all 2019 racing events at IMS when accompanied by an adult general admission ticket-holder.